Focus on the best idea, understand why it works, know why it will fail before it fails, and figure out how to make it succeed. Describe your nominated project—give us your elevator pitch. 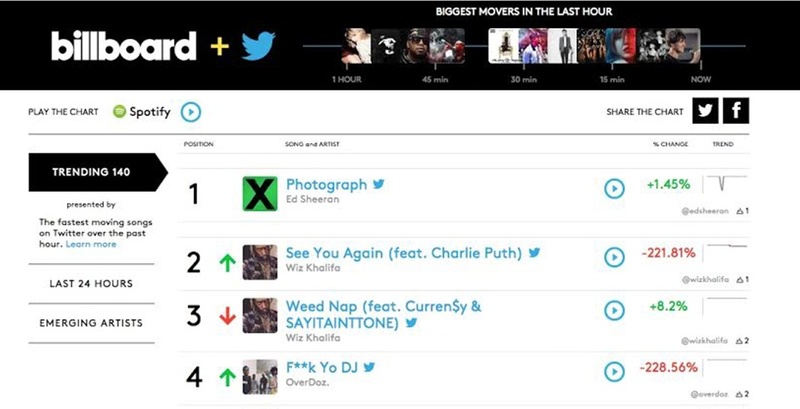 The Billboard + Twitter Charts are the first charts of their kind, measuring real-time conversation of songs across Twitter in the US. As it's most basic level, it's a trending topics list for songs. Because it measures conversation, the Realtime Charts aren’t beholden to release schedules and therefore capture new and interesting topics not normally covered on Billboard’s charts. When did you first know that this work was something special? Artists began to get behind the Real-Time Charts after their songs were going number one -- sometimes before their song or album even came out. This was a true feat for them, since they were being ranked without having an album or song for sale. What made your work unique and how did that present obstacles for you to overcome? The major obstacles? The data. Handling a large volume of real-time measurement and being able to display something that’s constantly changing in a meaningful way was no easy task, but we knew we had to do this right upon launch.